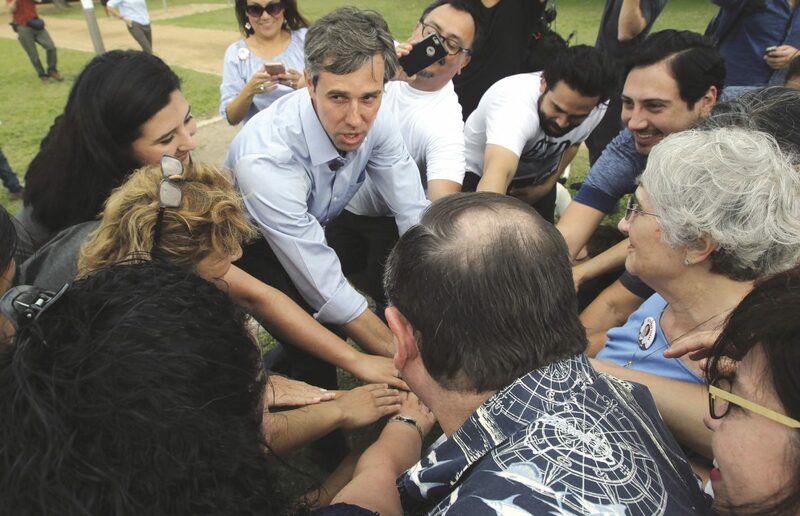 Senate candidate U.S. Rep. Beto O'Rourke gathers supporters for a huddle as he campaigns at Bill Shuppe Park in McAllen on Wednesday, May 02, 2018. U.S. Rep. Beto O’Rourke, D-El Paso, will visit Border Patrol and Customs and Border Protection facilities in McAllen on Monday to meet with immigrant detainees and asylum seekers. U.S. Attorney General Jeff Sessions in May announced that the Trump Administration was implementing a new border enforcement policy known as “zero tolerance.” The directive criminally charges anyone caught entering the country unlawfully. In doing so, any families apprehended are broken up — adults are brought to federal court to be charged with misdemeanors, while children are sent to shelters and foster homes across the country. The policy has caught the attention of several non-border members of Congress, leading one to visit the Rio Grande Valley last weekend. U.S. Sen. Jeff Merkley, D-OR, attempted to enter an immigration detention center in Brownsville when local police were called. Merkley was not permitted to enter the Southwest Key Programs detention center in the former Walmart on Padre Island Highway in Brownsville. After being denied access, Merkley was soon asked to leave by leaders at the facility. Also during his visit, Merkley toured Border Patrol’s McAllen processing center, as well as the Catholic Charities-operated Humanitarian Respite Center in downtown McAllen. Merkley visited the Valley to “check in” on the zero tolerance policy, which he called “morally bankrupt” in an interview after his trip here. The new policy has had fatal effects, according to a Washington Post report on Saturday. A Honduran man, who was apprehended with his wife and 3-year-old son in Granjeno last month, killed himself in a Starr County jail cell in May upon being separated from his family, the report said. When the family was in CBP custody in a McAllen processing center, the man “lost it,” and the Post report said agents deemed him as a potential threat to fellow apprehended immigrants. Agents then moved him to the Starr County jail in Rio Grande City, the report said. O’Rourke shared the Post’s report on his Twitter account Saturday night.